Sometimes we ask why we are put in certain circumstances. But God is sovereign, and we are not, and sometimes He has foresight far beyond what we are capable of seeing. Paul and Silas were having a good trip in Philippi. They met this woman named Lydia, and she is converted to Christianity (Acts 16:14). She is pretty wealthy and has the men stay at her home (v. 15). But then trouble starts. A demon-possessed girl follows them for days on end, mocking them (vv. 16-18). They get tired of it and command the demon to come out of her (v. 18). She was a soothsayer, and this ruined the income of the men that owned her. Things get bad. Paul and Silas not only have a multitude come after them, and get severely beaten, and get chained in the middle of prison, but they are treated so because they were following God. We as Christians face problems, and sometimes, if we are following God, we take flack for sharing the truth. It is easy to question these circumstances. It is easy to become bitter and defensive. But look at how Paul and Silas react. Their reaction is the opposite. They were filled with joy. They didn’t care about their unfortunate circumstances. They had complete trust that God would take care of things how He wanted. They boarded the roller coaster having no idea what awaited them at the bottom of the hill. And, indeed, God had a purpose behind it. The rest of verse 25 says that “the prisoners heard them.” Their testimony, their reaction to these circumstances, were noticed. Paul and Silas didn’t know what awaited them. They didn’t know how God was going to resolve the situation. But they didn’t care. They followed God with reckless trust in Him. The prisoners weren’t the only ones that heard. 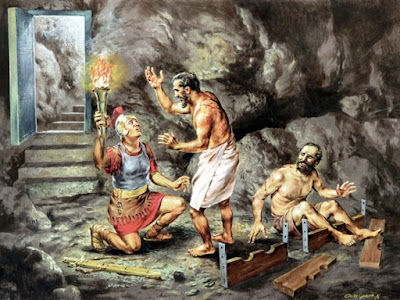 There was an earthquake that shook the chains off the prisoners, and the keeper of the prison was ready to kill himself for letting them escape (vv. 26-27), something Rome would do if he didn’t. But Paul and Silas didn’t leave. But what is more interesting is that none of the other prisoners left, either. These two men had such a profound impact on the men around them that they were content to stay and see what happened, or at least that’s how I see it. The keeper of the prison knew exactly what Paul and Silas had, because he runs in trembling and asks them what he must do to be saved (vv. 29-30). He becomes another Philippian convert and one of its first church members, along with his entire family. Some of the prisoners might have joined those ranks as well. We question why we must suffer through a certain thing. The answer is that God has a purpose. Paul and Silas suffered shaming, beating, and imprisonment so that God could bring a Roman jailkeeper to salvation. God had a reason. And they were completely willing to suffer those things for the sake of God’s plan being carried out. I totally get the frustration with circumstances. But God will use our testimony of how we handle them. A group of students was asked if we worry about our job situation after school. I was the only one to shake my head no. I don’t have to; I know that if I am in God’s will He’ll put me where He wants me. As I’ve said before, we look stupid to the world. It makes no sense to not worry. But they take notice. In these circumstances that would be expected to cause worry or frustration or whatever, our testimony is our reckless trust in our Father and Provider. When that is evident in these trials, the jail is going to take notice, and some awesome things are going to happen.